A mass protest in Paris on Sunday against French President François Hollande turned into an anti-Jewish demonstration and ended in clashes between police and protesters. 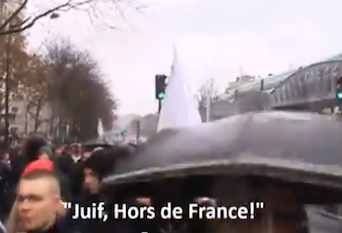 Seemingly, Jewish organisations around the world are scared by the recent developments in France. Once again, they clearly failed to appreciate the growing mass fatigue of Shoah indoctrination and belligerent lobby politics. However, I would contend that instead of whining about the “rise of anti-Semitism”, Jews better, once and for all, learn to ask why? Why the Jews again? Why are they hated? What is it in Jewish politics that evokes so much resentment? Why does it happen time after time? It wasn’t easy for me to admit in my latest book that Jewish suffering is actually embedded in Jewish culture. In other words, Jews are actually destined to bring disasters on themselves. Jewish politics and culture, unfortunately, is obnoxious, abusive, as well as racist, and supremacist to the bone. Jewish culture is set to infuriate the Goyim just because Jews are defined by negation – that chilling sensation of being hated. Interestingly enough, early Zionism, was a promise to change it all. Herzl, Nordau, Borochov and Weizmann believed that a “homecoming project” would transform the Diaspora Jews into ethical new Israelites. They were sure that a settlement project would make the Jew lovable and respected. But they were obviously wrong. Zionism was destined to crash. In spite of being driven by anti-Jewish sentiments, Zionism was quickly defeated by Jewishness (Jewish spirit, culture and ideology). It matured into a vile chauvinist amplification of every possible crude Jewish symptom it was initially supposed to eradicate. Many Jews around the world are commemorating the Holocaust this week. But if I am correct, maybe the time is ripe for Jewish and Zionist organisations to draw the real and most important lesson from the Holocaust. Instead of constantly blaming the Goyim for inflicting pain on Jews, it is time for Jews to look in the mirror and try to identify what it is in Jews and their culture that evokes so much fury. It may even be possible that some Jews would take this opportunity to apologise to the Gentiles around them for evoking all this anger. I would willingly take this opportunity and make an apology, but I have not been a Jew for a while now.